At this point in the journey, we had driven a decent amount – maybe 500 km – and it was fair to say we had seen a great deal of the wonders that make up New Zealand’s south island. We had figured out how to manoeuvre the mountain passes without falling over the edge and, crossed more than our fair share of one lane bridges (seriously… it’s ridiculous how many there are!) and seen glaciers and more magnificent vistas than I thought possible to exist in one country – but still we had more to go. Prettier than Franz Josef, but there wasn’t time to gawk! After waking up on the third full day in NZ, we drove to the nearby Fox glacier and took a look at what we could see. We heard from many people that this was the one that photographed the best from up close, but unfortunately a rock slide the day before prevented us from really getting up close and personal with it. 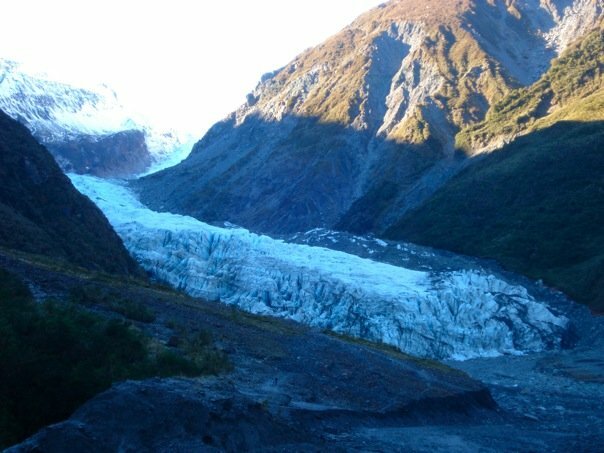 Thankfully we had spent a while at Franz Josef so we had a decent glacier fix in. I took a look at the map and our rough itinerary and realized I had it down for us to tour Milford Sound the next day, catching a boat at 11am. With us being about 800 km away, we really needed to get going if we were to accomplish that feat. Thankfully, the route to Te Anau was pretty tame and the drive times were realistic – which meant we could stop a few places along the way! As we made our way south through the tiny town of Haast (town might be a stretch, more like a cluster of houses), it was almost as though we entered a new world in Super Mario Bros… the geography completely changed and there wasn’t anything that reminded us of the grey gravel we were so used to seeing up until now. The region reminded us a lot of Rohan in the Two Towers, and for me, this is forever what this area will be known as. We eventually made our way to Wanaka, but there was no time to stop if we were to get to Te Anau by sundown (it already being 3pm). We had the option to stick to the main motorway or else take the ‘scenic route’ as pointed to by the sign. Of course, we opted for the latter and that is where I got to experience the beauty of Ben Lomand’s land. For anyone unfamiliar with it, as I was until I stumbled upon it, the drive is like being on top of the world. You’re staring down at these giant hill/mountains, set against beautiful lakes and low hanging clouds and you truly feel as though you’re the only people on the planet. 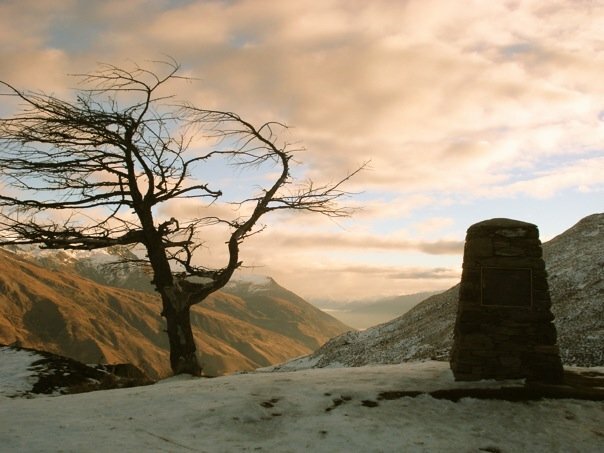 There was this monument and tree that looked particularly windswept and dramatic… it’s still one of my favourite pictures I have ever taken. After descending the area, we ended up by Queenstown, a place we unfortunately didn’t get a chance to explore… unless you count getting lost in it for 20 minutes as you realize you made a wrong turn. Queenstown looked like a cool spot to chill out – particularly during ski season, as it was now – but it was way too busy and we had other things on the agenda. Two hours later by about 9pm, we rolled into the Te Anau camper park and settled up for the night. We found out from the owner that the drive to Milford Sound was about two hours one way and to make sure we were gassed up as it was pretty remote – but one of the great drives on the planet. How were we supposed to sleep now?